Stephen Colbert is one of the funniest people in late-night television, and has been for a very long time. I must admit that I'm still a little sad that The Colbert Report is no longer with us, but now we can watch as Colbert takes his late-night genius to a more traditional stage on CBS with The Late Show. Over his years as a satirical pundit, Colbert has handed us so many hilarious jokes that even just casually thinking about some of his past work will have me in stitches. I still get a kick out of watching Colbert segments from years ago; somehow, the humor stays topical even if he's discussing old news. As hard as it was, I think I've narrowed all of Colbert's one-liners from throughout his television career to his absolute best. It's hard to pick out the best bits from someone like Colbert, whose jokes are often set up with a story, or include some physical comedy, or are a part of a recurring joke. However, some of his best jokes really stick out and stand up on their own. Almost always talking politics, but also frequently lamenting some new cultural trend, the Colbert Report host didn't shy from speaking his mind about skinny jeans, gay marriage or Catholicism. From the annals of Colbert's hallowed career, here are some of his most hilarious jokes. I can’t stand people who disagree with me on the issue of Roe v. Wade … which I believe is about the proper way to cross a lake. Folks, the skinnification of the American jeanscape has gone too far. Ah, Colbert. Always such an old grump. This one you just have to watch ... probably not in public, because you will laugh incredibly hard. The Pope is constantly talking about how the Church doesn't need to be so dogmatic or hierarchical. Which forces me to ask the eternal question: Is the Pope Catholic? And if not, where are bears going to the bathroom? Colbert delivered this line about Pope Francis at the Alfred E. Smith Memorial Foundation dinner in 2013. Both are fair questions! I seriously question whether you need this mascot to promote the idea of marijuana to college students. They already have a mascot: Their freshman roommate, Chief Big Bong. I want to bring a message of love and peace. Which I understand, that is your message. I want to bring the message of love and peace to a younger audience. People in their 60s, people in their 50s. People who don't watch your show. 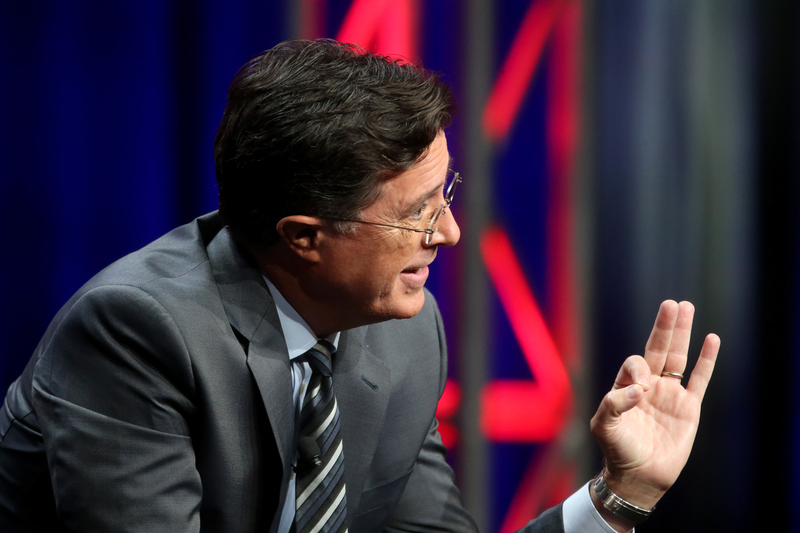 Colbert zinged O'Reilly to his face on O'Reilly's show, over and over. The whole interview is a treat. I have long warned you about the scourge of gay marriage. Well, yesterday, it man-on-managed to spread to the place I care about the most. When gay marriage became legal in South Carolina, Colbert was none too happy with the judge who made it happen, Richard Gergel. You and the other feminazis are coming for our balls, to snip them off, put them into a little felt purse, and take them away so we have to play your nonviolent games, right? When Colbert interviewed Anita Sarkeesian, he was at his satirical finest, making fun of the preposterous behavior of the men behind Gamergate.